$80 million for police, fire, health -- and rate payers? COLUMBIA, Mo 1/28/14 (Beat Byte) -- A little-known provision in the Columbia City Charter may prove a hidden pot of gold for basic city services such as fire and police, and utility rate payers struggling with water and electric bills that have nearly doubled in the last ten years. 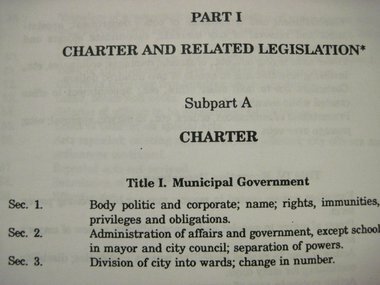 Surpluses (aka profits) from the city's mammoth water and light utility "shall be paid into the general revenue fund of the city and budgeted like other revenues of the city for any proper municipal purpose," Article XII, Section 102 of the Charter -- Columbia's guiding constitution -- mandates. "Such surplus may also, in the discretion of the City Council, be made the basis for reduction of rates in the future." The city's general revenue fund pays for basic city services such as fire and police. But with firefighters struggling to keep a First Ward fire station open; Mayor Bob McDavid worrying about money to hire more police officers without a tax increase; and ratepayers hit with a water rate increase in 2012 and an electric rate increase in 2013, surplus funds from the water and light utility are not making their way into lower rates or general fund revenues. Instead, the money is staying put -- in the city's water and electric utility fund, which had amassed an $80,682,155.00 "unrestricted fund balance" as of December 2012, the last full year reported on a Comprehensive Annual Financial Report (pg. 28). The money is part of a massive $143 million in "slush funds" sitting without any designated need or purpose across all the city's various accounts as of Dec. 2012. Surplus water and light funds have been a favorite target of senior city administrators, REDI, and Columbia business leaders. After a 2008 REDI report urged City Hall to increase business incentives for large developers, then city manager Bill Watkins proposed "taking $1 million to $2 million out of the electric reserves" which then totaled about $34 million "to buy land and extend the necessary infrastructure to make it ready for manufacturing or industrial uses," the Columbia Daily Tribune reported. "The money would essentially act as a city investment in real estate, Watkins said. 'I would much prefer that a private entity do this, but with the exception of the past efforts by" Bob "LeMone and his partner, no one else is doing this.'" Watkins' suggestion brought jeers from proponents of a comparatively paltry $88,000 subsidy for a recreation fund at Paquin Towers, a publicly-funded assisted living facility. Watkins opposed the subsidy. "Bill finds money for all kinds of things under all kinds of rocks, like $2 million from the water and light reserve fund to pay for shovel-ready land," then Third Ward Councilman Karl Skala said. The idea re-appeared in a controversial 2013 move to buy 100 acres for an electronic data center for $3 million from the same slush fund. Citing the water and light utility's "relatively strong financial position," Deputy City Manager Tony St. Romaine noted the electric utility alone was "expected to draw in $127 million" in 2013 revenue -- the city's largest business enterprise. "They have a very good fund balance," St. Romaine told the Tribune. The city's second largest business enterprise -- the water utility -- would make some $23 million in 2013, the Trib reported. Skala, the Councilman generally most informed about legislative and budget issues, was unaware of the Charter provision mandating the water and light surplus payments. "I had not read that before," he told the Heart Beat in December. "I plan to address with the city manager and ask for a report on it in the near future."